A most innovative technological breakthroughs today in Indonesia, a hybrid GSM or CDMA mobile phones using the Android operating system 2.2 Froyo. Support EVDO 800/1900 MHz frequency. Capacitive touch screen multi-gesture gives you complete control over your mobile phone. Coupled with other features like Wi-Fi, Bluetooth, A-GPS, G-Sensor and Wi-Fi Tether, you will no longer need another phone. Camera 5 MP with auto-focus has been integrated in it in order to capture every precious moment you. Backed with a memory card slot which can read Micro SD up to 32 GB, you will not feel any shortage. 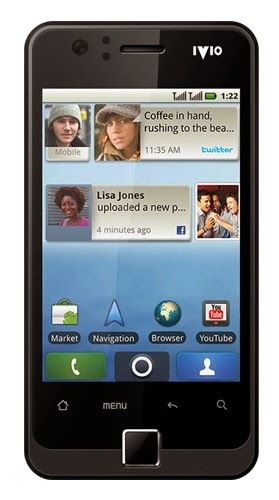 This is the best phone IVIO® you can have at this time, because with it your life will feel complete.